A devilishly good brunch dish courtesy of Adam Hyde at The Marwood, Brighton (themarwood.com). 1. Heat the olive oil in a frying pan and cook the chorizo over a medium-low heat, turning regularly, for about 10–15 minutes, until cooked through. Slice in half lengthways and set aside. 2. Preheat the oven to 220˚C, gas mark 8. 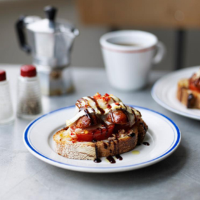 Toast the sourdough, then layer each piece with 2 slices of tomato and some chorizo. Top with a slice of goat’s cheese and scatter the chopped chilli, garlic and shallot over the top. 3. Place on a baking sheet and cook for 6–8 minutes until the goat’s cheese just starts to melt and soften. Drizzle with a little balsamic glaze and serve at once. More info: 24.7g protein, 1.2g fibre.